Not long after the U.S. got involved in World War II, the Office Of Naval Intelligence struck a deal with the Jewish mob and the Italian crime families of New York to put the screws to the longshoremen’s unions and keep supply ships on the Northeastern seaboard safe from the presumed threat of Nazi saboteurs. The net results of this program were of questionable value, but that hasn’t stopped it from taking on a curious second life in the annals of World War II trivia, held up as proof that even the bad have their better angels. Joe Johnston’s aw-shucks homage to adventure serials and American can-do, The Rocketeer, invoked the mafia-Navy story a quarter century ago. Now it returns, quoted like a parable of realpolitik, in Suicide Squad, writer-director David Ayer’s attempt to pry an assortment of B-list and C-list DC Comics villains out of the clammy hands of nerdlingers and get them on his own strict regimen of edgy posturing and manly personal crises. Ayer, who caught his big break by writing Training Day, likes to paint the world as needing bad to keep it from worse, but his black-and-gray mentality isn’t that much different from black and white. The team of the title is the brainchild of gimlet-eyed fed Amanda Waller (Viola Davis, seething contempt), who has turned ancient witch Enchantress (model-turned-sort-of-actor Cara Delevingne) into a teleporting super-spy and is now looking to expand her roster of expendable, plausibly deniable special operatives. 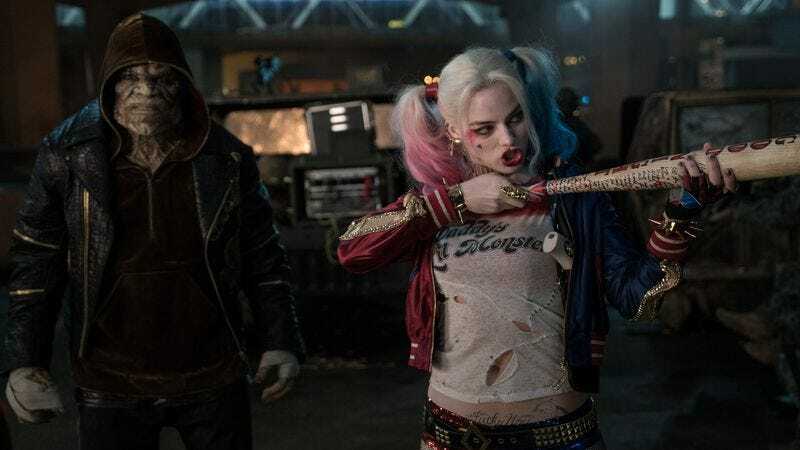 To that end, she assembles a misfit crew of colorful psycho killers: marksman Deadshot (Will Smith); the Joker’s gun moll, Harley Quinn (Margot Robbie); chisel-toothed reptilian Killer Croc (Adewale Akinnuoye-Agbaje); El Diablo (Jay Hernandez), a reformed gangbanger who can shoot fire but prefers not to, like some Bartleby figure of tattooed supervillainy; and a sweaty, sentient tallboy can named Captain Boomerang (Jai Courtney). They may all be “bad guys,” in the preferred parlance of Suicide Squad, but that doesn’t mean that they can’t be called upon to do the thing that all superheroes do in contemporary comic book movies: keep a crackling skyward beam of energy from destroying the world. And, lo and behold, an eldritch evil is unleashed in Midway City, onetime home of Hawkman, and our putative antiheroes are helicoptered straight into the eye of the shitstorm—or trash- and fungus-storm, if you wants to get technical. They have been implanted with explosives that will blow their heads clean off at the push of a smartphone app and put under the command of Rick Flag Jr. (Joel Kinnaman) and his indeterminately sized team of Navy SEALs, who can number two or 20 depending on the scene. 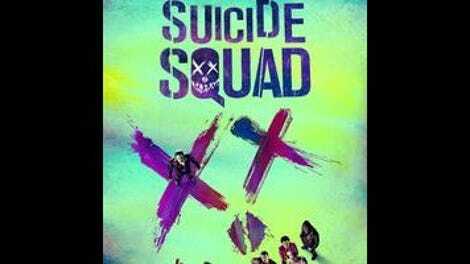 Like so many of Ayer’s directorial efforts, Suicide Squad feels like it was re-drafted in the editing room. It’s clumsy, disrupted by at least eight different plodding flashbacks, filled with lines of dialogue that cut well into trailers but make zero sense in context, and patched up with an embarrassment of rock-along musical cues. (Putting “Fortunate Son,” “Bohemian Rhapsody,” “Sympathy For The Devil,” and “Spirit In The Sky” in the same movie has to count for some kind of record.) In other words, it’s an exercise in attitude over everything else. Even the idea of nihilist camaraderie, which should come naturally with the Peckinpah-by-way-of-post-Crisis-DC premise, feels like a load of hooey; the characters are often too busy posing to exchange more than a few words at a time. But here, one almost feels the need to come to Suicide Squad’s defense. Insofar as the shared filmic universe/fan-investment pyramid scheme currently being put together by DC Comics, Warner Bros., and Zack Snyder (last visited in Batman V Superman: Dawn Of Justice) has a house style to distinguish it from Marvel Studios, it’s this: Marvel makes movies that are plotted like crossover events, while DC makes movies that look like collections of art pieces and variant covers. Compared to the indistinguishable Helicarrier environs favored by Iron Man, Captain America, and the rest of the Marvel gang, the comic book world of Suicide Squad feels rich with grotesque touches and varieties of texture, from the dank to the ostentatious. Ayer’s last film, the gory World War II flick Fury, represented a major step forward in terms of visual style that’s kept up here. His camera loves The Joker (Jared Leto), who pops up intermittently, dressed in gold lamé and alligator-embossed vinyl, his skin chalk-white and his hair toxic green. Harley Quinn, his former psychiatrist, enters every shot like a hypersexualized pinup—except for one, a brief moment that finds her apart from the rest of the Squad, suggesting a flicker of suppressed inner life. The two of them wiggle and paw like homicidal horny teenage lovers who seem to have broken out of Arkham Asylum and straight into Spring Breakers, plunging into a chemical bath as though it were the ultimate gesture of goth-industrial romance. And there is Deadshot, walking down a street with his preteen daughter, wearing a black felt hat—like a classic Stetson Boss Of The Plains, but with an indented crown—which lends the character an immediate sense of classy dignity that’s more palpable than any empty talk of moral code. (For the record, he doesn’t kill women or children; for everyone else, he accepts credit cards and bank transfer.) One almost suspects that’s why Suicide Squad—which pits its supervillain operatives against endless waves of bog-black spore zombies, like rejects from a survival horror game—never really works as an action movie. It’s too concerned with how the characters look individually—whether swinging a baseball bat or aiming a gold-engraved Chiappa Rhino—for any two shots to connect causally. If you’re gonna make a subpar superhero movie, you might as well do it with some flair.